I received an e-mail from Jörn Oleby, author of the book, ”Canine Massage and Stretching – A Dog Owners Manual". Jörn had wrote an informative article called "Warm up your dog!" and wanted to know if I would like to share it with the readers of All About Labradors. What do you think my reply was? Well... those of you that know me by now, understand that anything that can be helpful to our lovable Labrador Retrievers will be posted on this blog. Working dogs, Hunting dogs, Bird dogs and regular family dogs are often exposed to sudden, extensive pressure, in their work or during lively play in the exercise yard. Another example is putting the dog into a cold car in the winter and then letting it out to run around and play. We can take a racing Greyhound as an example. When the race starts and the dog is released from the starting box in reaches a speed of 60 kilometres an hour in a few seconds. If the dog has not warmed up and the tissues are not prepared for exertion there is considerable risk of strain and other injuries. By warming up we mean getting warm through activity and increasing the temperature in the musculature. The increase in blood flow allows the muscles to absorb nutrients more easily. The speed of nerve impulses causing muscles to contract increases and the dog is able to run faster. A sound warm up does not tire the dog but rather increases blood circulation and warms up the muscles ensuring that the joints are lubricated and more supple. The dog is then ready to perform more demanding physical exertion without running the risk of injury. Warming up (regular family dogs) can involve walking with the dog on the lead for 15 - 20 minutes before allowing it to run freely. In this way the muscles soften up and and are ready for physical activity. Competitive and working dogs could warm up in a more goal-oriented way. · Let the dog walk slowly for a while and then increase the tempo for 2-3 minutes. · Let the dog trot for 2-3 minutes. · Let the dog gallop for one minute. · Then let the dog make some short explosive moves. · Let the dog wind down a little by going back to trotting and then walking. As a dog owner there is nothing we can do to prevent all accidents. However we can prevent muscle related problems and strain injuries by warming up our dogs regularly. Under these conditions the dog can access optimal gait and stretch to its full length. This keeps the dog well- balanced physically and psychologically, allowing it to retain the agility of the young dog to an advanced age.Warming up should be an automatic element in the health care, a complement to your dogs daily exercise, obedience training an diet and are suitable for all dogs regardless of breed, age or size. Here is the second article I found dealing with a new gene that scientist are stating is linked with the exercise-induced collapse in Labrador Retrievers. I have received many different questions in regards to Labrador Retrievers, who shortly after exercising, running or hunting, start to lose control of their rear legs, become wobbly and then collapse (exercise-induced collapse). While going through my Labrador Retriever news e-mail and websites, I was very pleased to read that scientist are stating they have identified a gene linked with the exercise-induced collapse in Labrador Retrievers. Subject: Animal Rescue Site - PLEASE DO THIS 'FREE' GOOD DEED. Hi, all you animal lovers. This is pretty simple... Please tell ten friends to tell ten today! The Animal Rescue Site is having trouble getting enough people to click on it daily to meet their quota of getting free food donated every day to abused and neglected animals. It takes less than a minute (How about 20 seconds) to go to their site and click on the purple box 'fund food for animals' for free. This doesn't cost you a thing. I want to thank Jamie for sending this in. I have posted about the Animal Rescue Site before and will continue to post about it to remind all about how easy it is to help. I also have links for this posted in our "All About Labradors Links" for quite some time. All it takes is one simple click to help! My sis-in-law Sammie, who runs Fun 4 The Children blog received a wonderful e-mail from Jennie of Patriot Lab Rescue, asking to using one of her Christmas dog coloring pages for their 2008 Christmas Dog Coloring Contest. The contest is a Christmas Fundraiser to help out Patriot Lab & All Breed Rescue, a 501c3 all volunteer non-profit foster home based rescue. When Sammie told me about the contest I had to get involved to try and help out with the wonderful job the Patriot Lab Rescue does in trying to rescue our lovable breed. The contest they are running is a simple fundraiser that involves children. It's a dog coloring page that can be downloaded from the Patriot Lab & All Breed Rescue website. Your children can then color in the photo and send it in where it will be voted on by the public. There will be multiple winners, with the winners receiving a prize and being featured on their website during the holidays. There is a $1 donation fee per coloring page, and a $1 donation fee for the public to vote on the pages that are enter. It's only $1 dollar to enter the contest and then $1 more if you want to vote on the coloring pages, with the money going to help out with the wonderful job the Patriot Lab & All Breed Rescue does. To enter and learn more about this contest, please visit the Patriot Lab & All Breed Rescue website or the Graceful Dogs blog. If the readers of All About Labradors could help me spread the word about this contest, it would be greatly appreciated. I'd like to thank Jennie and all the volunteers at the Patriot Lab & All Breed Rescue for all the love and caring in their work at the rescue! Hello to all! I hope everyone is doing well. I received an e-mail from Stacia over at Revolution PR, alerting me to a product called DERMagic and a contest they are running called, "Spa With Your Dog Month" Photo Contest, that I thought the readers of this blog might be interested in. DERMagic, a Seattle-based company which produces an all-natural and organic line of skincare products for pets, has declared September "National Spa With Your Dog Month"! With the launch of its new Dead Sea Aromatherapy Bath Salts, at SuperZoo 2008, DERMagic is announcing the first annual ‘dog-i-day, inviting pet owners everywhere to participate in "National Spa with Your Dog Month" using the new heavenly scented DERMagic Bath Salts. Contestants can enter the contest by submitting their best family-friendly doggy bath-time photo - be it in a tub or a shower, together or apart, barely wet or soaked to the bone. The winning dog and owner the winner will receive a complimentary DERMagic Luxury Spa Kit, valued at $59.95 and be featured on their blog at http://www.dermagic.blogspot.com/ and in the next DERMagic newsletter. Here is a copy of the press release with more information in regards to DERMagic and the DERMagic "Spa With Your Dog Month" Photo Contest. Company Launches Aromatherapy Dead Sea Bath Salts with Relaxation-Inspired Contest for People and Pooches at SuperZoo Las Vegas. LAS VEGAS - September 9, 2008 - DERMagicSkin Care for Animals, an all-natural and organic line of grooming and treatment products for dogs, announced today "National Spa With Your Dog Month" to launch its Aromatherapy Dead Sea Bath Salts, a unique blend of human-safe Dead Sea Salts that safely and effectively relieve dry skin, itching, and dandruff, leaving the coat and body fresh and relaxed. The all-natural and organic bath salts are specially formulated by organic chemist Dr. Adelia Ritchie, to soothe the skin with the therapeutic power of natural sea minerals and nutrients. DERMagic has found not only do these special bath salts benefit pets; they also offer great results for pet owners, drawing toxins from the skin for a soft and invigorated finish. 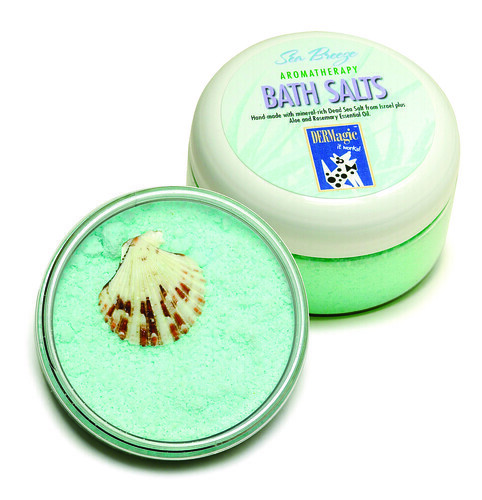 SuperZoo attendees can get a sample of the new Dead Sea Bath Salts by visiting the DERMagic booth #2727. DERMagic is inviting pet owners everywhere to participate in "National Spa with Your Dog Month" using DERMagic's newly available Dead Sea Bath Salts, and to take a chance at winning the DERMagic Luxury Spa Kit, valued at $59.95. Contestants can enter by submitting their best family-friendly doggy bath-time photo - be it in a tub or a shower, together or apart, barely wet or soaked to the bone - to info@DERMagic.com. For more information and details on the contest, pet owners can visit http://www.dermagic.blogspot.com. The winning dog and owner will also be featured on our blog at http://www.dermagic.blogspot.com and in the next DERMagic newsletter. The inspiration for the contest came from DERMagic customer Tresha Jacky, who wrote to us to say "One day I was bathing my dog Webster in a tub with DERMagic's Dead Sea Bath Salts and the smell was so intoxicating I decided to step in to soak my feet. When I got out of the tub, I could only focus on how soft and wonderful smelling my feet and ankles were, even though Webster was shaking water all over the bathroom. It lasted for days, so now when Webbie is due for a bath; I jump in the tub with him and enjoy the same benefits." For more information about DERMagic products, please visit us at SuperZoo booth #2727 or visit www.DERMagic.com. About DERMagic Skin Care for Animals, Inc.
DERMagic uses only the finest all natural anti-bacterial and anti-fungal ingredients formulated with certified organic whole-leaf aloe Vera, nutritional vitamin-E, lanolin, beeswax and soothing natural oils. DERMagic products are currently available online at www.DERMagic.com, and in finer pets shops and salons throughout Oregon and Washington. All DERMagic products are guaranteed safe and effective, and contain no cortisone, antibiotics or harsh chemicals. I just wanted to let everyone know that the All About Labradors blog is not affiliated or compensated in any way with DERMagic. What I would really like is for one of the readers of this blog, along with their lovable Labrador Retriever(s), is to win the DERMagic "Spa With Your Dog Month" Photo Contest! Get your Labradors all soaped up and make sure to enter the contest. If a reader from this blog does win, I will also feature you on All About Labradors and Labrador Retriever Pictures blog. Can I take my Labrador Retriever Golfing? The answer to the question is no! Because you never know what our lovable Labrador Retrievers might swallow. A black Labrador Retriever named Oscar had a ball while snooping around a golf course near his home. Senequoi.com is offering a free sample of Purina One dog or puppy food (they also have samples of kitty and cat food available). Information about Senequoi.com - "This website serves as a foundation to create the link between pet care companies and pet owning consumers. Senequoi is setting out to provide cheap and/or free solutions to consumers seeking better pet treatment, as well as providing an invaluable resource to pet companies: allowing them to better understand their demography." Purina ONE® offers a line of innovative formulas to meet your dog's changing and unique nutritional needs. Whether your dog is a puppy or adult, Purina ONE formulas provide super premium nutrition for good health you can see in your dog." Visit the Senequoi website to make your request for a free sample bag of Purina One pet food. For your information - Offer available exclusively to residents of the United States. Masked intruders lurk on the doorstep, making demands and threatening mayhem. You know it’s all in fun, but Halloween can be anything but a treat for the dogs in your family. Think about your dog’s safety in the same way you would think about the safety of a small child, he advises. Here are some more tips from Crowe to keep your canine companions from getting spooked this year. 1. Ins and outs: Don’t leave your dog outside on Halloween, even if your yard is fenced, Crowe advises. Your pet is too vulnerable to mischief-makers outdoors, and increased activity in the neighborhood and costumed trick-or-treaters may cause anxiety. Instead create a safe haven for your dog in the den, laundry room or other room. Play music or turn on a fan to drown out the ringing doorbell. Give your pet a blanket or something soft to snuggle on, or an item of clothing with your scent on it. Throw in a favorite toy or two, and be sure to check on the dog frequently to reduce its stress. 2. Show some restraint. It’s best to keep your dog away from the front door, to limit its excitability, aggression and chances of running away, Crowe says. If you can’t keep your dog in a separate room, restrain it with a leash or block its access to the front door with a doggie gate, and draw the curtains so your pet can’t see all the costumed kids climbing your steps. 3. Safeguard the sweets. Keep candy away from your pet, Crowe advises. Chocolate, especially dark chocolate, can be toxic to dogs, and candy wrappers can cause choking. Because we need to keep the candy bowl accessible, dogs often help themselves when we’re not looking. Although some dogs can eat candy without any ill effects, Crowe says to call your vet if you suspect your pooch has nabbed some chocolate. Common reactions include heavy breathing and salivating, lethargy and unusual behavior. 4. Tag, that’s it. You’ve blocked the entrance to the living room, but the minute you turned your back to tend to the trick-or-treaters, your sneaky little pup dodged the roadblock and squeezed through the barely open front door. Despite our best efforts, it happens, which is why Crowe says it’s imperative to make sure identification tags are securely attached to your dog’s collar. If your dog does get out, Crowe says not to chase it, or your pet will “think he is leading you in a game.” Instead, he says, “run the other way. Crouch down, make your body language inviting, and don’t lunge at the dog.” When your pet gets close, tickle it under the chin, then slowly bring up the leash and attach it. 5. Protect the pumpkins. Excited or agitated dogs can knock over a pumpkin, an especially scary prospect if it’s lit by a candle. Be sure to put jack-o’-lanterns out of the reach of your dog. 6. For success, don’t dress. Think twice about putting a costume on your dog. While some dogs might enjoy being dressed up, many don’t, Crowe says. Experiment first to see if your dog likes being in a costume. If the pooch shows any resistance, don’t do it. Dogs feel enough stress around Halloween without having to endure the discomfort of a costume. Subject: Black Labrador Retriever losing hair on the top of her feet and spots around her mouth - part II. Thank you for getting back to me. Her name is Star. I also have her sister who's name is Raven. I will try to answer you questions in the order you asked them. 1. No raw skin. Just pink to red irritated skin. 2. All four paws have bare :knuckles" from her licking/chewing. 3. She seems to lick them more when she has been active and is calming down to a rest state but she still licks them periodically. 4. Food is Pedigree dry small crunchy bites. She also gets Ol Roy dog biscuits (multi-flavored and peanut butter) and of course some table scraps. 5. We have not noticed any crusty areas. 6. The bare spots look like rectangles on her paws. 7. I have not noticed any greasy or foul smelling fur. 8. Her eyes seem to have a thin line of lost hair around them. Thanks for resending your answers. I did receive photos of Star, but not the ones of her paws. Here is a website that deals with a condition called Lick Granulomas. Take a look at the photos and let me know if this is what Star's condition looks like. Labrador Retrievers that lick their feet all the time may have allergies. Atopy (inhalant allergies) are the most common in Labrador Retrievers. Dogs with Atopy, lick and chew at their paws and scratch their face, eyelids and ears. Just like with people, your Lab can develop allergies to something it inhales, such as grass pollens, tree pollens, and weeds, with many of these being seasonal. Other allergens can include molds, house dust, and mildew, which can be around all the time. Keep Star out of rooms several hours when you vacuum. If you have a basement, you will also want to keep Star out of it. Contact allergies, when Star comes into contact with something she is sensitive to, can also cause her itchy paws. Food allergies to something eaten (dairy products, wheat, beef, chicken eggs, chicken, wheat, soy and corn), can occur at any age and may mimic the signs of an inhalant allergy. These animals tend to have recurrent ear and skin infections unless the allergy is identified and the allergy is addressed. Food allergies can be complicated to recognize and to treat. The problem is figuring out what the allergen is. Allergy testing can be done by your veterinarian, such as blood tests or intradermal skin testing. The better allergy test is intradermal skin testing, which is usually done by a veterinary dermatologist. You may want to visit a veterinary dermatologist (you can ask for a referral from your vet) if he/she is not one themselves. Veterinary dermatologist are specialists that tend to see chronic and odd cases, and often recognize unusual syndromes a general practitioner may miss. You may also want to try changing Star's food by setting up a special "hypoallergenic diet", for a possible food allergy. I would definitely do away with the Old Roy treats, as I feel they are of very poor quality and probably just about one of the worst dog foods and treats available ( I'm sure I will catch some flack on this). Make sure you give the trial at least twelve weeks on the new food. Absolutely no other treats should be given during the food trial. The only exception is if they are based on the same food sources as the test diet. Make sure you are strict with the new food test, offering no other foods and NO table scrapes. These companies also offer treats based on the same food sources as their foods. If you need other recommendations on food and treats let me know. One thing that I make sure I use with my Labrador Retrievers and feel that all Labradors should be supplemented with is probiotics and digestive enzymes. Probiotics are live cultures found in yogurt which will help out in maintaining and increasing the good flora (bacteria) of the gut. You could also supplement Star's diet with regular, non-flavored yogurt with live cultures daily. Make sure there are no sugars or sweeteners in it. You could add it to her food, or your can use it in the Kong toys if you use them. One reader of this blog stuffs it into the Kong toys and freezes it. A nice cool bath can be helpful, since the water will assist in relieving the itching. You can add a little colloidal oatmeal (Aveeno) to the bathwater, which will help soothe the paws or your veterinarian can prescribe an antiseptic shampoo. Make sure you rinse Star's foot thoroughly after the bath, since any remaining soap that remains can make the itching worse. Another method that you can try is Aloe Vera applied to the paw. Make sure its 100% Aloe Vera, like the kind from the plant (you can find in health store) not the mixture. This will also not hurt Star if she is to lick it off. There is also the possibility of Star's constant licking being a case of boredom or stress. Mange is an irritation of the skin, which will generally result in hair loss and sometimes can include inflammation, rashes and itching. Demodectic mange is caused by a microscopic mite called Demodex canis. These mites are a normal residents of your Labrador Retrievers skin, but not all Labradors are affected by them. There are three forms of mange: localized, generalized, and demodectic pododermatitis. It is very possible Star is dealing with the localized demodectic mange. Demodectic mange occurs when the immune system is suppressed, which basically causes these mites to "get out of control" causing hair loss as well as skin problems. It is found mostly in young dogs, who acquire it from their mothers. In puppies, some of the first signs are usually hair loss around the eyes, chin, mouth and forelegs. These symptoms will often fade as your Lab pups immune system matures and is able to resist these mites, helping to clear it up by itself. "When a puppy develops localized demodicosis the chance of the condition resolving is 90% unless there is a family history of demodicosis in related dogs. In this case, chances drop to 50%." Mange can be diagnosis by your veterinarian, usually by doing a test called a skin scraping. Your Labradors skin is scraped and then put under a microscope to check for the mite. As I stated earlier, often it is best not to treat this condition and to simply allow it to resolve on its own. That is if Star does have demodectic mange, which your veterinarian will be able to tell you. I hope this is of help for you and Star. Please keep me advised on Star's condition and please let me know what your veterinarian tells you, should you choose to take her. If you don't understand anything or have any questions, please don't hesitate to write.